1/4 teaspoon or one sachet of ISOThrive provides a pure, concentrated dose of soluble fiber to feed your gut what it needs to be healthy and happy. “Scientific studies have confirmed that a properly functioning gut is required to achieve optimum health and prebiotic soluble fiber is not optional,” says Jack Oswald, CEO, CTO and Co-Founder of ISOThrive. 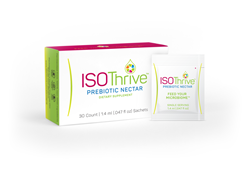 ISOThrive, the first naturally fermented concentrated prebiotic nectar – the essential natural soluble fiber that heals and protects the gut by feeding your gut bacteria – is now available. Just a quarter of a teaspoon of mildly sweet ISOThrive Prebiotic Nectar is all your beneficial bacteria need every day to keep your gut well fed and functioning properly. Westernized diets, typically low in prebiotic soluble fiber, are causing silent but detrimental damage to the gut with every meal. The gut is responsible for a surprisingly large number of key bodily functions including immune system regulation, hunger and satiety, mineral absorption, healthy cholesterol levels, blood sugar management and of course, digestive balance and regularity. The beneficial bacteria in the gut produce a key energy source that keeps the gut functioning properly. But in order to do that, these bacteria need to be fed a steady diet of prebiotic soluble fiber. In his book “The Good Gut”, Stanford University microbiologist Justin Sonnenburg presents evidence that if you don’t provide your beneficial bacteria enough prebiotic soluble fiber, they will instead consume the protective lining of the gut in order to survive. In extreme cases of low prebiotic soluble fiber intake, the gut cells atrophy and can die. Renowned and respected doctors and microbiome experts including David Perlmutter, Deepak Chopra, Mark Hyman, Joseph Mercola and Michael Pollan all agree that a healthy gut is key to good health, and prebiotic soluble fiber is a necessity. Made of the same special prebiotic soluble fiber found in fermented foods like kimchi, sauerkraut and traditionally fermented sourdough bread, ISOThrive only includes the fiber that the good bugs like to eat, so there are no negative side effects such as digestive discomfort, gas and bloating that are found in other prebiotic supplements. In fact, it actually helps relieve those symptoms. ISOThrive is sold in boxes of 30 sachets, a one-month supply, and is offering introductory pricing at its web site. For more information, visit http://www.ISOThrive.com. ISOThrive is the brain child of leading carbohydrate and microbiome scientists. This team of experts have worked for more than five years and raised over $2 million to develop ISOThrive to be a pure, naturally fermented form of prebiotic soluble fiber that is crucial for nourishing and strengthening your good gut bacteria. For more information, visit http://www.ISOThrive.com.